In the final phase of its initiative the Enable Makeathon 2.0 (EM2), the International Committee of the Red Cross (ICRC), on Thursday announced the names of six teams which will be competing as finallists in their bid to win the competition and secure the opportunity to build and scale their innovations for persons with disabilities (PWDs). Team Bleetech from Mumbai has developed a low-cost version of an encyclopaedia for persons who are hearing impaired, where users can ask questions on a mobile platform (either in sign language or English), where they receive answers to their queries in Indian sign language. Team Autobots have developed an app that supports pregnancy diagnosis for the visually impaired using molecular imprinted diagnostics for detecting pregnancy for blind people while Team Unicom Solutions have created a mobile application which focuses on unifying all forms of communication into a single platform where a deaf person can communicate his message using sign language which will then be transferred to another person by converting the message into either a text or voice and vice versa, using a smartphone. Team Welava from Delhi has developed a product which aims at making tourism more accessible and memorable to the persons with disabilities through a universal design solution by entry ticket redesign. Team Torchit has developed a hardware solution called ‘Saarthi’ which can be attached to a walking cane and will help a blind person through feedback in the form of a buzzing sound and vibrating sensations. Team For Growth from Bangalore has developed a product which acts as a marketplace connecting persons with disabilities to various jobs/internships using artificial intelligence combined with human curation to help persons with disability elevate their career and independence. Team GameAble has developed a software which can provide access to disabled people enabling them to play video games like their peers. It features gesture recognition-based control software. Team Amparo’s Confidence Socket is a prosthetic socket made of thermoplastic which can be remoulded easily according to growth or change with each individual. Team Nonspec has designed and developed a below the knee prosthetic system that is dynamic, affordable, lightweight, adjustable, and can be mass produced. 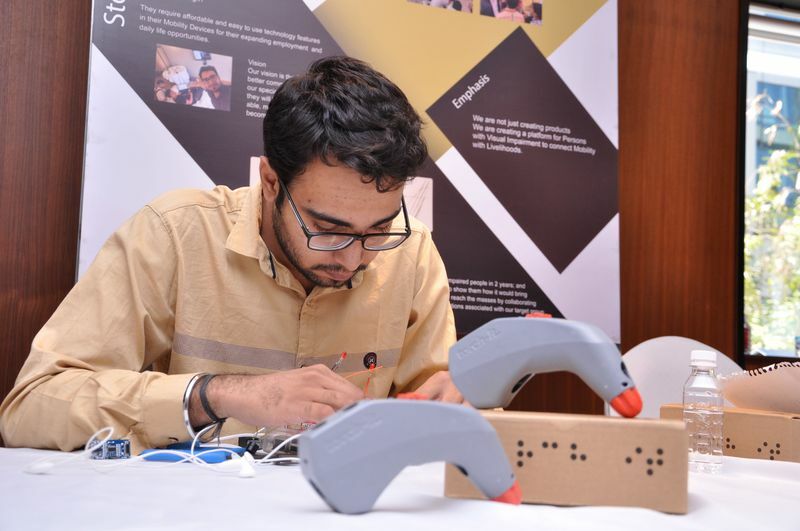 The Enable Makeathon (EM) is a programme initiated by the ICRC and its partners, including the Global Disability Innovation (GDI) Hub, to develop prototypes and affordable solutions for challenges faced by PWDs, particularly those living in rural areas. 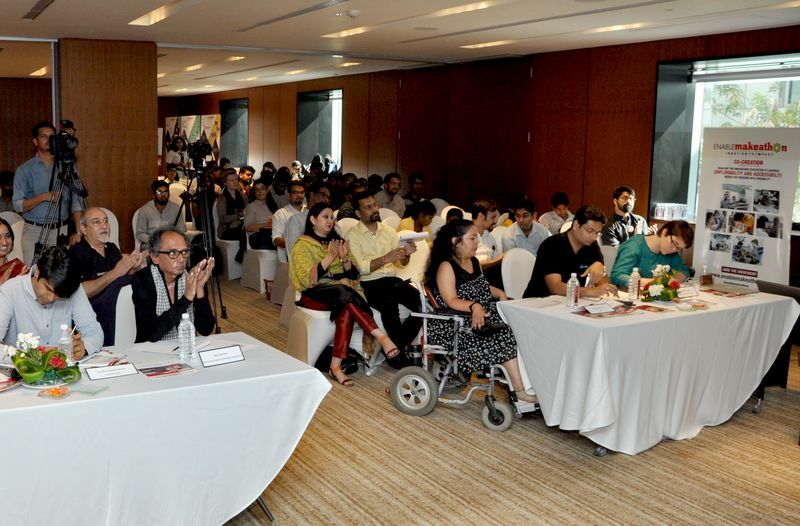 Teams comprising engineers, scientists, designers, innovators, PWDs, humanitarians, manufacturers, investors and entrepreneurs compete against each other for grants that will allow them to further develop and market their innovations. Each of the contesting teams are developing an innovation that directly responds to one of the 12 Enable Makeathon challenges, including access to education, access to tourism and access to transport. The EM2 will culminate on 6 February 2018 where three winners will be selected for an incubator grant and will get a chance to participate in a 1-year incubator programme to further develop and scale their solutions.